Iran’s Deputy Foreign Minister Hoosein Amir-Abdollahian said today that Foreign Minister Javad Zarif will not attend the next round of Syria talks scheduled for this weekend in Vienna. The surprise announcement did not offer reasons for Zarif’s decision not to attend. There were speculations in Iran’s social media that Zarif will be accompanying President Rouhani on his visit to Rome and Paris this weekend, but that could be an afterthought, as Zarif was not scheduled to travel with Rouhani until today’s announcement. Abdollahian was also non-committal if the Iranian delegation without Zarif would attend the Vienna talks. Abdollahian, who was speaking to the pro-Hezbollah al-Mayadin TV upon his arrival in Beirut, added that the United States should provide “answers regarding some unilateral actions taken by some of the sides, without consulting other participants in talks.” He said Tehran “would not tolerate actions that violate the agreement reached in the Vienna I.” It was not understood which sides and what actions Abdollahian was referring to and whether they were linked to Zarif’s boycott of the upcoming meeting. Pro-regime Syrian media reported today that Israel has launched airstrikes on Damascus International Airport on Wednesday. 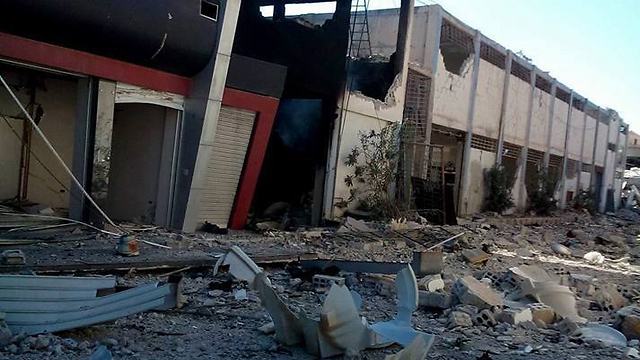 Photos published on Twitter allegedly show that the main terminal, with duty free shops, has been hit. The airstrikes were reportedly launched at around 6 p.m. local time, and could have targeted weapons air shipment into the airport. The last reported Israeli strike in Syria was on 31 October, reportedly hitting a weapons convoy close to the Lebanese-Syria border in the Qalamoun Mountains region. Iran-led pro-regime forces, under the command of Quds Force Commander Gen. Qasem Soleimani, scored an impressive, if symbolic, victory on Tuesday in breaking ISIL’s siege of isolated Kuweiris Airbase southwest of Aleppo. The Islamic State fighters had surrounded the government airbase for nearly two years. The Kuweiris operation was part of a larger Iran-led offensive in Aleppo province. The main goals of the Aleppo offensive appear to be pushing back rebel strongholds southwest of Aleppo City, controlling the line of communications in the area, breaking the rebel siege of Shia villages of Nubl and Zahara, and attempting to encircle the city of Aleppo, where the opposition control eastern half of the city, as a last step before launching an assault against the opposition in east Aleppo. The Aleppo offensive, which began in early October, brings together the Quds Force, IRGC Ground Force, Lebanese Hezbollah, Iraqi Shia militias, and Afghan and Pakistani Shia fighters, under Soleimani’s command, supported by Russian air power. In the first month of the offensive, Iran and its allies have suffered heavy casualties during the intense fighting. Elsewhere in northwest of Syria, Russian-enabled Syrian government forces simultaneously started other offensives in northern Hama and southern Idlib against opposition forces. The goals appear to be pushing out the opposition from Hama province and regaining territories lost to the opposition in Idlib province in order to reduce the threat to vital government heartland of Latakia. The Idlib-Hama offensives, however, appear to be stalled at strategic Al Ghab Plain, bordering Latakia, and in Hama. On 5 November, Jund al-Aqsa-led fighters scored a major victory against the regime and retook the town of Morek in northern Hama.